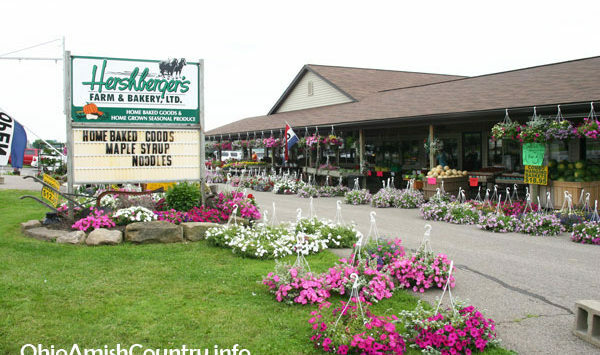 Hershberger Farm & Bakery has a number of regular customers who keep coming back for fry pies and the other homemade baked goods that are a hallmark of the area. This farm stand is located two and a half miles southwest of Berlin on SR 557. The Hershberger familyhas been in business at this site since 1986, when Daniel Hershberger’s father started selling produce from the 77-acre family farm. Originally, the business was known as Hershberger’s Truck Patch. Since many people today don’t know what a truck patch is, the name was changed to Hershberger Farm and Bakery. (Farmers used to put out a “patch” to provide extra family income from selling vegetables to city folks). Many family groups visit during the peak season. To make it interesting for everyone, we have a small menagerie of animals near the market’s parking lot. Children have fun looking at goats and other small farm animals. Seasonally, the market offers wagon, buggy and pony rides for a small fee. Field trips are always welcome at Hershbergers Farm and Bakery.